Johan Sebastian Bot is coming from Colorado. At his active he has a lot of tracks he posted on his Soundcloud page but, as far as I know, SENTIENCE is his first release with the DVS NME monicker. The EP contains two original tunes and three remixes (two of "Sentience" and one of "Norse funeral"). The peculiarity of the main tracks is that they have no drums. I know that talking about electronic music without drums could make you think about ambient music but "Sentience" and "Norse funeral", could not be filed under that genre, because the rhythm is present and it is generated by synth arpeggios. 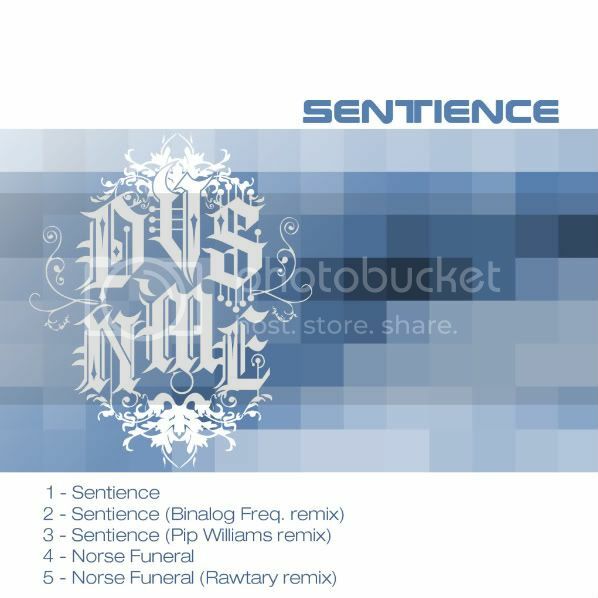 In balance from dreamy atmospheres, ("Norse funeral" has nice warm synth pads along with soft leads) and cinematic sci-fi atmospheres ("Sentience" melodic progression is catchy and evocative) DVS NME did two cool songs I'm sure you'll dig. About the remixers: they all added rhythm lines to the tracks, keeping the bass line and the main synth leads and added syncopated percussive drum lines with a bit of Mediterranean flavor (Binalog Freq on "Sentience" used bongo sounds and a lot of "stop and go", just to exalt the cinematic essence of the original tune), retro sounds with several new melodic arpeggiator lines (Pip Williams remixed "Sentience" and he kept the main melody but used different synth sounds) and electro robotic atmospheres that substituted the original dreamy ones (Rawtary on "Norse funeral"). This is a nice release and you'll find it on sale from Junodowload starting from December the 13th. Influenced by the latest Prodigy, Narsti, from UK, landed on Basserk on the fourth volume of the Some Tunes CD compilation series and now they are ready to deliver their first EP titled STEREONAZI. Two out of four tracks are new ones as "Not as strong as the machines" was already on the fore mentioned compilation and the closing track is a remix of the main track (which now sounds like a dance tune for nuclear bombing). On this EP Narsti followed the rule "if you have to do it hard, do it harder" and brought hard beats, syncopated distortions and many layers of rhythm plus balanced doses of synth arpeggios. Their formula isn't new but work well and Nasti know where to hit! After two years of silence (their previous release was Blastromen's "Blasteroid" EP), X0X Records is back with a new solo release by Sero, member of Sektoid. INTERCEPTION SYSTEM EP contains two versions of the original tune and three remixes done by Dj Overdose (he did two of them) and Morphology. The original track is an upbeat new electro tune with space atmosphere inserts that couple dark lead synths and vocals, creating, in this way, a mysterious atmosphere while syncopated 808 beats make no prisoners. Synth layers alternation, great sounds and fast rhythms will make fall in love the electro audience. "S.I.S." Dj Overdose remix, focus the sound on the a new rhythmic pattern (which recalls the original one), adding a mid tempo bass line and melodic synth lines. I liked the contrast created by the fast drum beats and the synth pads. The second remix by Dj Overdose is the "Poser remix". On this one we have an upbeat syncopated drum coupled to menacing lead breaks and few melodic parts. Mophology, for their remix, decided to go straight to the bone of the original tune and reworked it totally, keeping the vocals (that have been filtered) and adding a nice dry bass line (almost funky) and a new rhythm (it is always upbeat but it sounds more classic electro). After a while, pads and lead solo phrases enrich this cool mix. The closing track is a 2' short one and resume the original tune. I really liked the release, so I give my welcome back to X0X Records! As the title suggests, FOLLOW ME REMIXES is a collection of remixes of Capacocha's "Follow me" song. On this release we have 13 version of the track and the peculiarity is that each remixer worked on the track of the previous one. I'll try to describe them. Ricky y Rulo made a great mix of electro and dance with stop and go. Petr Passive, did a mid tempo retro gaming version with distorted synth lines and filtered robotic vocals, focusing on melody and 4/4 rhythms. Rawfare, made a distorted syncopated dance track with raw vocals. Ray, focused on clean vocals (that recalled me LCD Soundsystem), upbeat dance rhythms and distorted bass lines. Sjammie the Money, after an intro made of synth chords and 80s dance atmospheres, turned the song into a nightmarish electro dance song just to switch between the two. Cepi, de-structured the song and made two different parts (the first almost techno with repeated vocal samples and the second a sort of grime techno mix). Fantastadon, remixed the tune making it turn into a great cinematic mix of ambient dub and grime. Ikki, focused their mix on an hypochondriac blend of synth wave and techno. Bronstibock, chose 4/4 distortions alternating grime, techno and dance. Aux Raus, mix sounds like a upbeat blend of gabber and synth wave. Jack Lomo, did a seducing mix using dance syncopated atmospheres and distorted bass lines with the original vocals on evidence. De Grote Vinnie, Donnie En Sjakie Show remixed the track keeping the essential and adding distorted filtered synth leads. Rufus Baxendale, kept the original vocals adding sweeping synths, distorted 8 bit bass lines and upbeat dry drum beats. Nice release! One year after "The Horn" EP, Bronstibock are back with their second release (which is more an album than an EP, since it has a length of 44 minutes). SJAFRAS contains nine new tracks that are in balance from melodic dance mid tempos characterized by grime bass lines and 4/4 rhythms (like the opening "Patta of gewoon" or "Bullerslug", songs that have two guests on vocals, Don de Baron and Aux Raus), a bit of dub and hip hip (check "Yabyamma"). Of the lot "Game on" (track that you can find also on "Some Tunes III"), "Beasty" (a great dance floor killer) and the closing "Hotter then hot" are the most immediate one, thanks also to the contrast between distorted sounds and clean vocals. The whole EP is nice. It don't bring on the table new ideas to the sound we already know but this isn't mean that you won't be able to enjoy it.